The Hungarian economy attained moderate growth in 2013, to a large extent due to the outstanding agricultural output related to favourable weather. 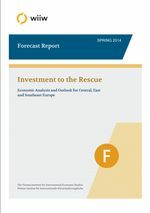 In the last months of 2013 investments began to recover from hibernation but consumption remained flat. 2014 will bring about a modest acceleration of GDP growth driven by an upturn of primarily EU co-financed investments and net exports. Institutional conditions for a more robust economic growth will likely remain unfulfilled.